A wide variety of digital products color people's life, one of which here must be referred to is digital camcorder, making shooting videos a simple and interesting activity. It not only captures wonderful videos, but also the special and excited moments that deserve to be treasured all through your life. However, there is still something that frustrating you when you'd like to play these amazing camcorder videos on your QuickTime. Why does it happen? Well, hold on if you want to get a full understanding of it. Free Convert Camcorder Video to MOV Now! Best free AVCHD video transcoder for Mac - MacX Video Converter Pro to free compress and decode camcorder video to MOV on Mac for playback on QuickTime or iPhone iPad, 83X fast! Different from digital camera that records images in a single file format JPEG, digital camcorder records video in a number of different file formats. So it is important to be aware of these formats, two of which that are commonly supported by camcorder are AVCHD and MOD videos, since they are closed bound up with the problem mentioned above. AVCHD camcorders can capture very high quality video. Its video often compressed in MPEG-4 AVC/H.264 format, and audios are recorded in Dolby Digital. So it is wise to convert AVCHD video to MOV first in case you want to transcode camcorder videos to MOV format. MOD: an informal name of tapeless video formats used by JVC, Panasonic and Canon in some models of digital camcorders. Its format name corresponds to extensions of video files. MOD is used exclusively for standard definition video files. In the similar way, you can first convert MOD video to MP4 MOV if you camcorder videos come with .mod extension. MOV: a pretty common multimedia format used to store and play movies and other video files, compatible with both Macintosh and Windows platforms. MOV format is widely used in various devices, perfectly with QuickTime Player, VLC Player or iMovie, iDVD, Final Cut Pro. etc. If you shoot some amazing camcorder clips, and want to play them on QuickTime, import AVCHD camcoder video to iMovie, you'll need to convert camcorder videos to MOV first. In other words, it is necessary to decode AVCHD/MOD videos to Mac friendly format like MOV. To tell you the truth, changing camcorder videos to MOV is as easy as learning A-B-C once you own a good tool. 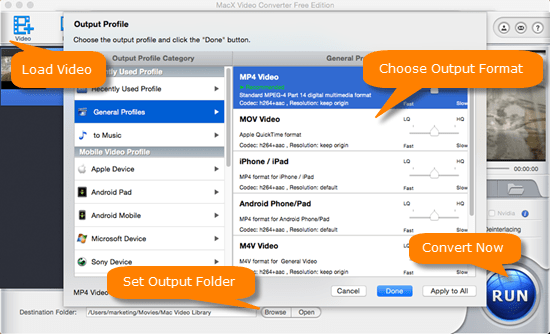 Here MacX Video Converter Free is highly recommended to help you free transcode either AVCHD or MOD videos to MOV format on your Mac with ease. Thanks to its straightforward interface, the whole conversion can be therefore finished in a couple clicks. After free downloading the top video processing tool and run it, click "Add File" button and locate the videos. "to MOV" as your output format. You can also convert AVCHD to MP4, MOD to HEVC, H265 to H264, MKV to MOV, MP4 to MP3, etc. After finish the above steps, click the "RUN" button to start transcoding the camcorder videos to MOV format on your macOS. For those who would like to free download and decode videos to iPhone (iPhone Xs), iPad (iPad Pro, iPad mini 4), iPod, etc, from YouTube, FB, etc. the advanced MacX Video Converter Pro is the second-to-none choice for you to make this happen, with up to 1000+ video music movie sharing sites supported. Plus, it's also the perfect tool for you to download videos, make photo slideshow, record on-screen videos, etc. Best HD video processing app can convert HD MKV, MTS, M2TS, TOD, MOD, AVCHD and other camcorder videos files to MOV, MP4, AVI and other mainstream formats with high quality so that you can share them on YouTube, Facebook or play them on iPhone iPad with ease.